I’ve mentioned before that I have avoided make up brushes indefinitely, in favour of just using my hands to apply my foundation. How times have changed though, and I’m now scouring high and low for the best make up brushes out there. I’ve tried a few, from the cheapo ones to the ones you see before you today, which all just so happen to come in at a pretty reasonable price! Each one of these I could use happily for the rest of my foundation wearing life, as they are all equally as good as each other. 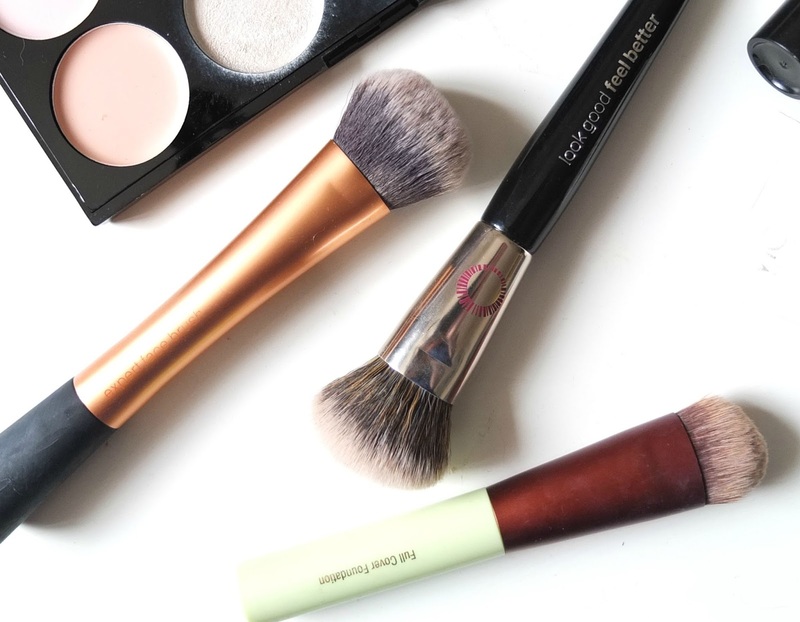 At first I really turned my nose up at the prices of make up brushes, but now I don’t think I could go back to applying my foundation with my fingers! I feel a bit ridiculous saying that, but let’s face it, sometimes you do have to make a bit of an effort to look flawless don’t ya? ✓Real Techniques Expert Face Brush: This was one of the first brushes I bought in my new found brush adventure. I really love the shape of this and how the bristles are just the right length. I found that with ‘foundation’ brushes, which are usually quite a long, flat shape, I still manage to get streaks in my base. But with brushes like this one, I can buff my make up straight in to my skin, streak free. ✓Look Good Feel Better Multi Tasking Brush: The newest edition to my make up bag and ohhhhmyyygahhhhhdd, how did I live without it? It’s the softest brush, ever and not only that it supports a global charity which helps to support women with visible signs of cancer treatment. They have pledge to donate a minimum of 30k of their sales to the ‘Look Good Feel Better’ charity, which makes this brush even more fantastic. Especially when you hear rumours that they’re made by the same manufacturer as Real Techniques so you know they’re going to be excellent quality! ✓Pixi Full Cover Foundation Brush: I use this one more for buffing concealer on top of my foundation, than as an all round foundation brush. It’s got really dense bristles, which provide a full coverage of whatever product you’re applying. Used with the Make Up Revolution Ultra Base Palette, you’re laughing all the way to the flawless complexion bank. What are your tips for the perfect base? Do you use a Picasso like selection of brushes, or go for the fingers like I used to? Next Post Bear With Me….